LEED V3 Provides New Tools. Many homeowners are running amok trying to sell their homes in a downturned economy. The design/build professional Christopher Prelitz, LEED AP, founder of Prelitz + Partners, owner of New Leaf America, and author of the book Green Made Easy, has been renovating buildings with green features since 1993. An active member of the sustainable building community of Southern California for nearly 20 years, Prelitz says, "If you green it, you will sell it." Perhaps Prelitz's most profitable market is green-ovating homes and flipping them for nice profits. The concept sounds "easy," but doing a green renovation is often seen as such an elephantine task that many walk away from the idea with their eyes dazed over. First of all, the USGBC has conducted original research and has profiled the research of many others who claim that green buildings are easier to sell. Secondly, the USGBC is working diligently to demystify the process by which an owner can either build new or renovate a building sustainably. Within LEED's newest version of rating systems, called LEED 2009 V3, are a new green building priorities list coupled with a credit weightings categories list designed to get a green building team motivated and start them off on the right green foot. LEED's new tools are intended to help owners better understand which decisions will make a greater positive impact on the environment. "An asset that maintains its value through higher occupancy and easier maintenance is easier to sell and may command a higher market valuation. There is growing confidence in the industry that a high performance green building can either capture lease premiums or present a more competitive property in an otherwise tough market. Reduced operating costs also generate increased cash flow, which helps free capital for other investments. As green buildings are increasingly recognized by LEED and ENERGY STAR programs, the marketplace is expected to follow with a system of preferential pricing." While designing a building, the professional may ask him/herself: how do we decide whether it would be a good idea to install a roof garden or to add additional insulation to boost the exterior wall’s insulation R-factor? When we work on a building in Florida, do we focus on the same green goals as we do for a similar type building in the arid Southwest? Who or what is/are the most knowledgeable green information sources that may facilitate our green goal decisions? Evaluating a building according to its green attributes is one of LEED’s lifelong goals. To answer all of these questions, LEED came up with a priorities list of environmental impact categories and an associated matrix tool to help. Troy Adkins, Director of Membership at the USGBC, says of the sustainability priorities list below that it is, "... in my strong opinion, the most exciting thing we have done in LEED for a long time, well, since I have been here and that goes back a long time." To hear Adkins describe this dynamic tool, visit the Vimeo video and begin watching at min 13 of the 60 minute lesson of LEED's new 2009 V3 rating system. This new priorities list is truly revolutionary because it reveals the idea that not all green building attributes are on the same playing field in terms of their environmental benefits. Any efforts to invest in sustainability are helpful, but our ultimate goal should be to achieve as environmentally friendly a building as is possible for the square footage and dollar resources available. The USGBC's Weightings Tool Matrix is a pre-programmed spreadsheet based on the above listed sustainability priorities list that was implemented when revamping all the rating systems to conform to the new 2009 V3 version released this past Fall 2009. “Credit re-weighting is the redistribution of the available points in LEED so that a given credit’s point value more accurately reflects its potential to either mitigate the negative environmental impacts of a building or promote positive impacts,” according to the usgbc.org website. To help building owners make decisions about what green features to implement in their new builds and renovations, the Weightings Tool can be used on a case-by-case decision about which credits are most beneficial for their local environment. The Weightings Tool Excel spreadsheets are available in 2007 Microsoft versions and can be downloaded from the USGBC website. While the spreadsheets are still fairly rudimentary, the USGBC hopes to further refine and develop them for more powerful use in the future. Due to the fact that the priorities list puts the greatest emphasis on energy efficiency and the reduction of CO2 emissions, it makes sense that the number of credits for the energy and atmosphere (EA) category of LEED rating systems was increased from 30 in V2.2 to 35 in 2009 V3. The energy efficiency credit itself, within the EA category, has also increased from 15 to 18 points. By investing in renewable energy, a project is now eligible for two more points, up to six in total. Even as far as LEED has come with all of its research and revisions to the rating systems, the USGBC is still in a period of "thinking" about how they can invoke an even more powerful green building movement. It will take time and deliberation for our country (and the world) to develop a working understanding of how to design a building so that it will have the best positive impact possible on its surrounding environment, and so that it works in tandem with the new green intelligence tools. Prelitz began his career as a sustainability consultant working for a non-profit organization in Southern California which published the first U.S. journal on sustainability called Earthword Journal. 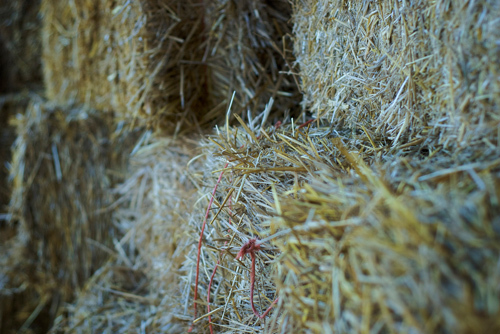 Learning that the burning of rice straw creates massive air pollution, Prelitz and two friends helped form another non-profit organization called the California Straw Builders Association (CASBA), which partnered with the rice growers to do moisture, fire, and seismic testing for straw-bale construction. 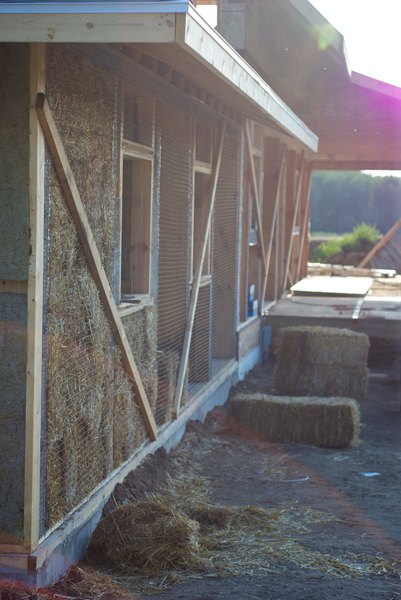 "CASBA was instrumental in having straw-bale construction adopted into the California building codes and Dept. of Energy standards back in the early 1990's," says Prelitz. 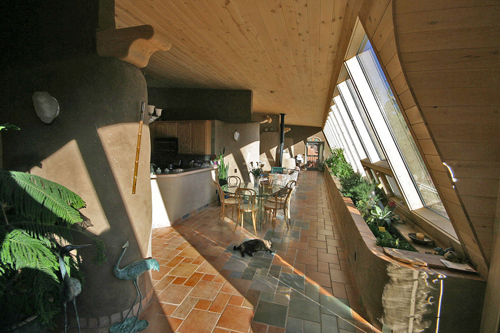 After years of researching natural building solutions, Previtz explains his view on passive solar design: "Why should we get caught up in complex active solar technologies when we can prevent the need for a large amount of supplementary energy through good site specific design? Nature gives us free, abundant heat, light, and cooling, yet we ignore these time-tested principles in favor of the ease of mechanical systems and thermostats." Amory Lovins, an early pioneer of intelligent sustainable design and founder of the Rocky Mountain Institute, coined the phrase nega-watt which means that saving energy is far more powerful than making it. "Many architectural designers are still missing the boat on sustainability," says Prelitz, "As I've seen LEED Gold buildings with solar electricity that are still using halogen lighting." He explains that high performance LED and CFL lighting today is 90% more efficient than Edison's 150 year old technology of using electricity to glow a wire white hot, i.e., incandescent lighting. Using high performance lighting such as CFLs and LEDs lowers the air conditioning and electricity demands. 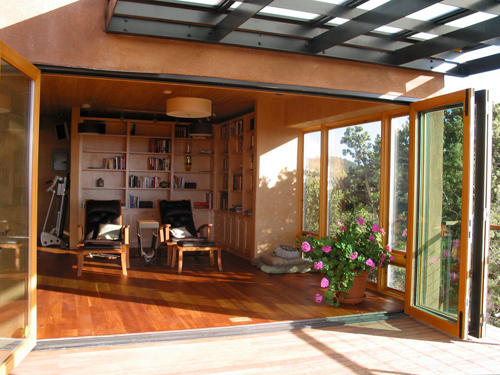 Previtz essentially believes that much can be gained by designing buildings with natural daylighting, proper passive solar orientation, and passive heating and cooling techniques. 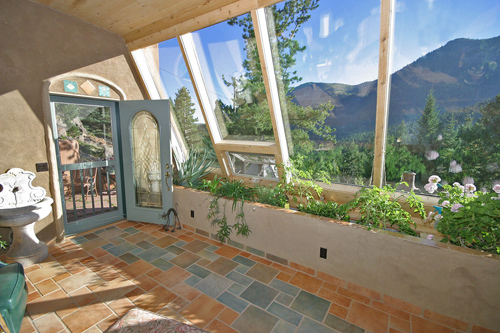 The solar electric condo featured in the above YouTube video was purchased for approximately $300,000 less than its final sale price. Previtz made nearly $100,000 in profit over the green flip. The home was originally built in the 1960's and had never been sold for more anywhere close to the "greened" sale price. "I wanted to show people that it is possible to turn an existing 1960's home into a net zero building," he explains. The renovation included the following: high performance doors and windows, LED and CFL lighting, high performance appliances, operable skylights for natural ventilation, solar water heating, solar electricity, and large amounts of interior thermal mass, to name a few things. "We had over 500 people come for the open house (with two policeman directing traffic), and two offers on the home that day. We took the offer for cash for just $5,000 less than our listing price," says Prelitz. What does Prelitz say about the state of architecture today in light of all his experience as a sustainability frontiersman? "Architectural design professionals are in a key position to reduce CO2 emissions. We must incorporate better sustainable design into our buildings by taking advantage of nature's free energies and by minimizing energy guzzling mechanical, electrical, and plumbing systems," concludes Prelitz, who I admire for his relentless efforts and his green intelligence to inspire a more sustainable future.